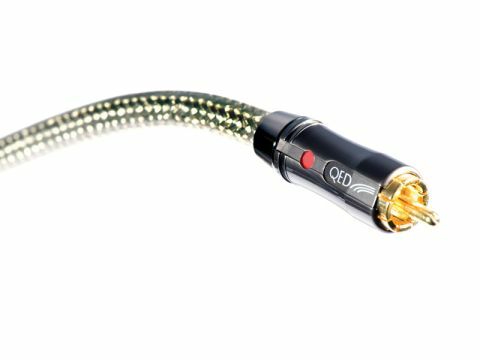 Unlike other cables in this group, the QED Reference Audio Evolution uses multiple conductors beneath the screen – four, to be exact. Connected as two pairs, they are twisted together to make a highly symmetrical assembly which has excellent rejection of interference from magnetic fields, something that normal screening can do nothing about. There is a screen as well, of course, connected at one end only and, therefore, not carrying signal current. It’s made up of silver-plated copper and aluminised plastic tape, while the inner conductors are also silver-plated and insulated in foamed polythene. The floating screen can be expected to make the cable slightly directional and it is marked for direction – don’t be afraid to try it reversed, though, as in some installations this can be beneficial. It’s eight millimetres in diameter, but a little on the stiff side. There’s a slightly bassy quality to this cable’s sound, something we rather enjoyed especially through smallish speakers. It’s not exactly a huge lift to the bass or anything like that, just a subtle increase in the ‘presence’ of low notes. And it’s mostly notes that are affected, not percussion, which is kept taut and energetic but not over-emphasised. Male voices also seem to benefit a little, with just a little more ring and resonance. It may not be strictly accurate, but it’s fun! Midrange and treble are certainly highly neutral and accurate, with very fine detail and excellent imaging, though the highest treble can sometimes seem ever so slightly dry.